“WASHINGTON – The United States is leading an effort by a handful of antiwhaling nations to broker an agreement that would limit and ultimately end whale hunting by Japan , Norway and Iceland , according to people involved with the negotiations. The compromise deal, which has generated intense controversy within the 88-nation International Whaling Commission and among antiwhaling activists, would allow the three whaling countries to continue hunting whales for the next 10 years, although in reduced numbers. In exchange, the whaling nations – which have long exploited loopholes in an international treaty that aims to preserve the marine mammals – would agree to stricter monitoring of their operations, including the placing of tracking devices and international monitors on all whaling ships and participation in a whale DNA registry to track global trade in whale products. Officials involved in the negotiations expressed tentative hope that they could reach an agreement in coming weeks. But ratification by the overall group remains uncertain. Some pro-whale activists say the deal would grant international approval for the continued slaughter of thousands of minke, sei and Bryde’s whales. They also say that the agreement does not prevent Japan and the other nations from resuming unlimited whaling once the 10-year period is up. But Monica Medina , the No. 2 official at the National Oceanic and Atmospheric Administration and the American delegate to the whaling body, said that Mr. Ramage and other critics were demanding a complete halt to whaling, an impossible goal, at least today. “We can’t stop it; we can only try to control it,” Ms. Medina said in an interview. Despite a 1986 international moratorium on commercial whaling, the numbers of whales killed annually has been rising steadily, to nearly 1,700 last year from 300 in 1990, as the three whaling nations have either opted out of the treaty or claimed to be taking whales only for legitimate scientific study. Most of the meat from the slaughtered whales is consumed in those three countries, although there appears to be a growing international black market in whale products . Some officials warn that if this effort at compromise fails, the commission’s efforts to police whale hunting, long crippled by irreconcilable political divisions, will collapse. Representatives to the whaling commission from more than a dozen nations – including the three whaling countries and New Zealand, Australia, Chile and other nations backing the compromise proposal – are in Washington this week to negotiate terms of the agreement, which would protect as many as 5,000 whales from hunting over the next decade, officials said. They said they hoped that the reduced hunt would give whale stocks time to recover and give negotiators time to write a new treaty that would bring an effective international ban on all commercial whaling. The group plans to release a new draft of the compromise proposal next week, but it still must win the approval of three-quarters of the members of the whaling commission at its annual meeting in Agadir, Morocco, in late June. 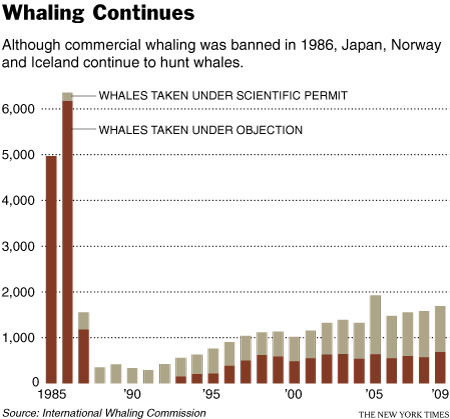 The Japanese, who killed 1,001 whales last year, are the linchpin of any deal. 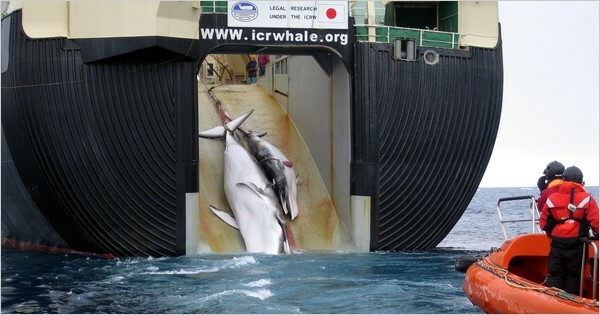 Although the Japanese taste for whale meat is steadily declining, the Japanese see their ability to continue to hunt whales, not only in their coastal waters but in the open ocean around Antarctica, as a question of sovereignty. Critics say that the practice survives only with heavy government subsidies. But a single whale can bring as much as $100,000 in Japanese fish markets. Japan is driving a hard bargain to demonstrate strength at home and perhaps to use as leverage in other international negotiations, officials involved in the talks said. Joji Morishita, a senior official of the Japan Fisheries Agency and Tokyo’s representative to the whaling talks, said in a brief telephone interview that he was not authorized to discuss his country’s negotiating position. But he confirmed that Japan was at least willing to talk about a new whaling program that may result in a substantial reduction in its whale harvest over the next decade. “We are fully engaged in this process,” he said. Populations of some whale species have been growing since the moratorium ended decades of uncontrolled hunting, but whales around the world remain under threat, not only from hunting but also from ship strikes, pollution, habitat loss, climate change and entanglement in fishing nets. Under terms of the compromise deal, which is being negotiated behind closed doors and remains subject to major changes, the three whaling nations agree to cut roughly in half their annual whale harvest. That would result in the saving of more than 5,000 whales over the next 10 years, compared with continued whaling at current levels. The deal also proposes that no new countries be permitted to take whales, whale-watching ships would be monitored by the whaling commission and all international trade in whale products be banned. 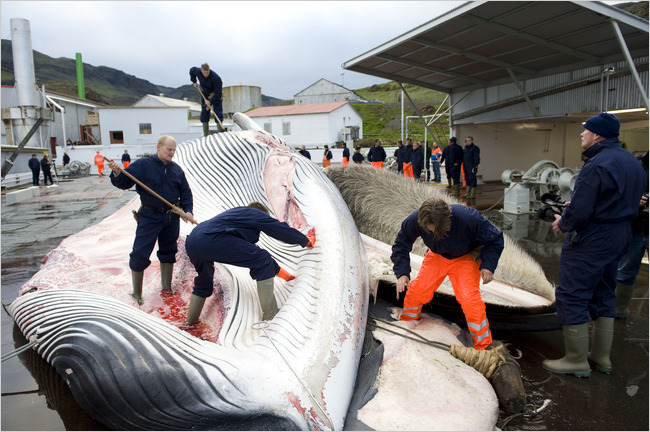 In addition, whalers would have to report the time of death and means of killing of all whales and provide DNA samples to a central registry to help track the end use of the dead animals. Limited subsistence whaling by indigenous peoples in the United States, Greenland, Russia and St. Vincent and the Grenadines would be allowed to continue. For the original article from the New York Times, click here.